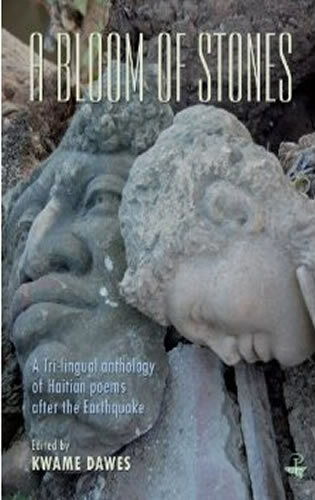 A Bloom of Stones: A Tri-lingual Anthology of Haitian Poems After the Earthquake. A Bloom of Stones collects the work of more than thirty Haitian poets, many who live in Haiti and others who are part of the large Haitian diaspora. Among this list are some of Haiti’s most celebrated poets as well as many of the country’s as yet unpublished younger poets. The poems offer a complex and sophisticated range of responses to the earthquake – poems about the rupture of love, the shock of sudden disaster, the hunger for more beauty in the world, the shattering of landscapes, and ultimately, poems that explore the incomprehensible nature of our mortality. Presenting French and Haitian Creole poems alongside their English translations, this tri-lingual anthology is a necessary bridge across languages in the poly-lingual Caribbean, and introduces readers to some exciting Haitian voices. Ultimately, these poems offer, in the midst of tremendous tragedy, a capacity to find beauty, where beauty constitutes truth, even harsh truths, elegantly rendered.